Friday the men will be the main attraction at the Miami Open as top ten players finally take court for second round play. The initial ATP match on display in Stadium Court showcases world number four Kei Nishikori against Kevin Anderson. The two played on three previous occasions all in 2015. Nishikori holds a 2-1 advantage in the win column. A former top 10 player, Anderson’s ranking has fallen to 74 due to niggling injury the last two seasons. However in looking to rebound, the 6 foot 8 inch South African will be quite a handful for Nishikori last year’s Miami Open finalist. Later on in the afternoon, four time Miami Open finalist Rafael Nadal, with the absence of Novak Djokovic and Andy Murray, begins his hunt for his first title in South Florida. Standing in the way in his maiden match is Dudi Sela. They’ve battled once before at the Australian Open with The Spaniard prevailing comfortably in three sets. In the evening session, Grigor Dimitrov collides with Guido Pella on Stadium court. Two years ago, they duked it out with Dimitrov edging the Argentine out in two tough sets 7-6,6-4. Ranked 13th in the world, Dimitrov should handle his opponent, now at 178, with ease. But factoring in that the Argentinian will have plenty of support from the pro South American crowd, things might get dicey for the Bulgarian. American Jack Sock fresh off his semifinal run at Indian Wells faces off against Japan’s Yoshihito Nishioka who himself as a lucky loser in the desert, had the tournament of his young tennis life so far. Nishioka shocked Ivo Karlovic and Tomas Berdych to arrive at the round of 16. He nearly collected his biggest scalp against Miami Open top seed Stanislas Wawrinka before succumbing in a third set tiebreaker after failing to close out the match twice after being up a break. In their second meeting, Sock hopes to do better than their first in Acapulco this year since he was unable to collect the W.
On the ladies’ side, with sister Serena sideline by injury, Venus Williams carries the family’s hope for this Miami Open. The three time champion last made an appearance in the finals in 2010 with an unfavorable result. She clashes with Beatriz Haddad Maia for the first time in the second round. Also, World number one Angelique Kerber starts her campaign for the title, looking to improving on her best showing in South Florida which was a semifinal berth in 2016. The German contends with China’s Ying-Ying Duan, the two have never battled. Click here for Friday’s complete order of play. Rafael Nadal and Fernando Verdasco won their opening match at the Miami Open on Thursday evening, beating Simone Bolelli and Andreas Seppi 6-3, 6-4. Nadal and Verdasco needed one hour and nine minutes to set up a showdown against the American duo of John Isner and Nicholas Monroe. The all-Spanish pairing took control with a service break at 2-2 in the first set when Nadal chose to return on the deuce point and started it nicely with a stellar backhand return. The Spaniards broke again at 5-3 to finish off the opening frame of play in style. Bolelli and Seppi appeared to be on their way out after donating serve at 0-1 in the second. Out of nowhere, however, Verdasco stumbled through the following service game with a flurry of errors and one double-fault to let the Italians back in the match. Bolelli soon found himself serving to stay in the match at 4-5, at which point another deuce situation ensued. 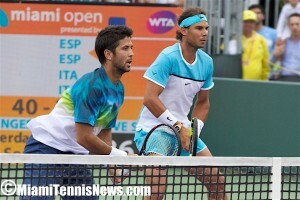 Verdasco got a shot at it this time and sent back a strong return that induced a match-ending error. Isner and Monroe pulled off an upset in an all-North American showdown against Jack Sock and Vasek Pospisil. The former UGA Bulldog and UNC Tar Heel saved 11 of 12 break points on their way to a 7-6(3), 6-3 victory. Sock and Pospisil, who finished runner-up in Indian Wells, won a horrendous 60 percent of the points when they put their first serves in the court. As the first round of singles action wrapped up, Denis Istomin produced a shocking comeback at the expense of Borna Coric. Istomin had not won a single match all season long and it looked like more of the same would continue when Coric served for the match at 5-4 in the second set. The 19-year-old Croat twice came within two points of victory, at 30-15 and 30-30 at 5-4. But Istomin broke back to stay alive and then broke again to force a third. It was soon Coric’s turn to battle back from a break deficit, which the world No. 46 did at 1-3. A streak of holds brought the proceedings to a 6-5 Istomin advantage and Coric buckled under the pressure when he served to stay in the match for a second time. Istomin broke at love to clinch a 4-6, 7-5, 7-5 triumph after two hours and 45 minutes. Among those joining the Uzbek in round two were Tim Smyczek, Denis Kudla, Sergiy Stakhovsky, and Pierre-Hugues Herbert. Ricky Dimon is a contributor in Miami and writes for tenngrand.com. You can follow him on Twitter under @Dimonator by clicking here. 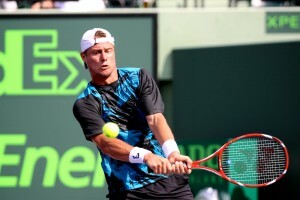 Lleyton Hewitt earned his 600th ATP match victory when he came back from a set and a break down to defeat Robin Haase 3-6, 6-3, 6-3 during first-round action at the Sony Open Tennis tournament on Thursday afternoon. Hewitt trailed 3-1 in the second set before mounting his charge with a streak of five consecutive games in his favor. The 33-year-old Australian worked similar magic in the third, although in that frame he did not fall behind by a break. Starting at 2-3, Hewitt reeled off four straight games to clinch victory. Haase double-faulted three times in the final game of the match, essentially sealing his own fate. A former world No. 1 and two-time Grand Slam champion, Hewitt improved his lifetime record to 600-241 after one hour and 57 minutes. His reward is a Friday night date with current world No. 1 Rafael Nadal. As for players who are not getting old anytime soon, Americans Ryan Harrison, Jack Sock, and Donald Young joined Hewitt in the second round. Harrison preceded Hewitt on Stadium court got the best of Federico Delbonis 6-2, 6-4, Young rolled over Carlos Berlocq 6-2, 6-2, and Sock made similarly routine work of Guido Pella in a 6-3, 6-4 win. Interestingly, Young’s only previous encounter with Berlocq had come at this same event in 2006, when the Argentine humiliated Young 6-0, 6-0. In the very next round, Berlocq lost 6-0, 6-0 himself–to James Blake. Young had no trouble turning the tide eight years later and he is safely through to an all-American showdown against John Isner. In history-making news of the day, Bernard Tomic made a premature comeback from hip surgery that had sidelined him since the Australian Open. The result was the shortest match of all-time on the ATP Tour, with Tomic going down to Jarkko Nieminen 6-0, 6-1 in 28 minutes and 20 seconds. The 21-year-old Australian won one point in the first five games, three points in the first set, and 13 points in total. 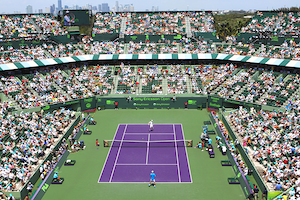 The Sony Ericsson Open has announced the wildcard entrants for this year’s tournament. American James Blake and Russian Dinara Safina highlight the list of wildcard players that will be playing at the Tennis Center at Crandon Park in Miami. On the men’s side of the draw the other wildcards include Americans Jack Sock and Ryan Harrison, Canadian Milos Raonic, and Bernard Tomic from Australia. Joining Safina on the women’s side of the draw are Heather Watson, Sorana Cirstea, Sabine Lisicki, Madison Keys, and Coco Vandeweghe. Here is the official press release from the Sony Ericsson Open tournament : BLAKE AND SAFINA HIGHLIGHT SONY ERICSSON OPEN WILDCARDS Current and rising stars are granted this year’s wildcards MIAMI, Fla. (www.sonyericssonopen.com) – The 2011 Sony Ericsson Open announced its wildcard entries and this year it features former World No. 4 James Blake and former World No. 1 Dinara Safina. A total of five wildcard slots were granted to the men’s draw and also include Jack Sock, Ryan Harrison, Milos Raonic, and Bernard Tomic. While six were given on the women’s side which feature Heather Watson, Sorana Cirstea, Sabine Lisicki, Madison Keys, and Coco Vandeweghe. Women’s main draw begins on Tuesday, March 22, while the men’s main draw kicks off the following day on Wednesday, March 23. The qualifying rounds will be held Monday and Tuesday, March 21 and 22. Tickets to the 2011 Sony Ericsson Open are on sale now and can be purchased by phone (305-442-3367) or via internet at www.sonyericssonopen.com. An electrifying two weeks of tennis conclude with the women’s final on Saturday, April 2 and the men’s final on Sunday, April 3.